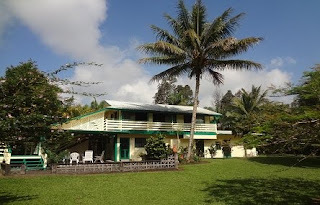 Stay at Hale Moana Bed & Breakfast and visit the local farmers' markets, where local foods and produce are sold. Whether you know them as warabi (Japanese), ho‘i‘o (Hawaiian) or ostrich fern (most of the mainland), the fiddlehead ferns are the young, edible, tightly coiled shoots of the fern that resemble the end of a violin or fiddle. The shoots remain coiled for about two-weeks before they unfurl into the delicate, lacy greenery we are all familiar with. The species most commonly found in Hawai‘i is the Pteridium aquilinum, which grows in temperate and sub-tropical regions. It was introduced to the islands by Japanese immigrants who value it mainly for the young stems rather than the unfurled coils. Certain varieties of the plant contain the carcinogenic compound Ptaquiloside and need to be cooked thoroughly before eating. Fiddlehead ferns are a very rich source of antioxidants Omega 3 and Omega 6, high in iron and fiber, and loaded with Vitamins A and C. They retain a deep green color even after cooking, and the taste is similar to a combination of asparagus, green beans, and young, tender okra. Look for smooth, shiny, dark green coils covered with light tan “fuzz” or as some people call it, “onion skin.” Snap the stem off with your hand at the place where it gives the least resistance and gather them in a basket, bucket, or open container. On a hot day any wild edible will begin to decompose rather quickly in a plastic bag. 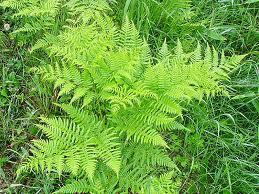 Choose small, firm, brightly colored ferns with no sign of softness or yellowing. If not planning on using right away, refrigerate, tightly wrapped in wet towels, for no more than two days. 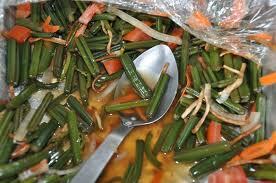 They should be washed and the ends trimmed before cooking by steaming, simmering, or sautéing. This salad was originally brought by my friend Jessie Hillinger to one of our frequent potluck dinners at Kolekole Beach Park. 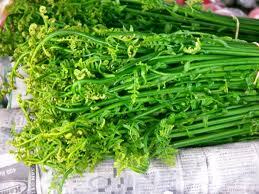 Warabi or fiddlehead fern stalks usually can be found at the markets in large bundles. After washing, snap the stalks at the breaking point and cut into one and a half inch pieces including the slightly unfurled frond tips. Boil in rapidly boiling water for 3-5 minutes. Drain and cool. Assemble the ingredients in a large bowl. Toss with dressing. Serves 4 to 6 as a side dish. ** Chili Pepper Water—Or as the locals call it, chili peppa wattah. Made with rice vinegar, Hawaiian sea salt, and tiny red hot Hawaiian chili peppers; some add a few crushed garlic cloves. Drain and rinse with cold water. Chop coarsely and reserve. Melt the butter in a large saucepan. Add the onion and cook until translucent, stirring occasionally; add the fiddleheads and sauté a few more minutes. Add some of the chicken stock, stir, and bring to a gentle boil. Cover and cook until fiddleheads are thoroughly tender, about 5 minutes. Use a blender or food processor to blend the fiddleheads with some of the stock until smooth (you might have to do this in batches). Pour it back into the saucepan, add the rest of the chicken stock and the milk or cream, reduce heat to medium. Be careful not to boil or the milk might curdle. Once dished, garnish with the lemon zest and paprika. If you like a very creamy soup, add less stock and more cream, or if your taste leans more toward lighter soups, omit the milk or cream altogether. I found I did not need to add salt, and used a bit of freshly ground pepper. Just one week for the Puna Breadfruit Festival!!! Are you attending? 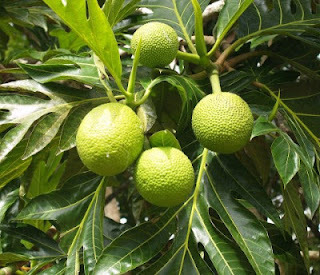 The Second Annual Breadfruit Festival in Puna will be held on Saturday, March 2 at the campus of the Kua O Ka Lā Public Charter School at Pū'āla'a, located next to ‘Ahalanui Hot Pond Park in lower Puna. The theme this year is E 'ulu nui a niu 'ola as the ‘ulu (breadfruit) is being paired with the niu (coconut) - Besides music, hula, many cultural and food demonstrations and a delicious buffet that will be available to the general public, the festival will again feature a Cooking Contest. The contest rules, guidelines and entry forms can be found when you click on links provided at the bottom of this article. The creative buffet menu is a collaboration between three chefs and a chocolatier using all locally grown or sourced ingredients; Chef Casey Halpern of ‘Café Pesto’ in Hilo, Chef Kanoa Miura of ‘Aloha Mondays’ Catering, also in Hilo, Chef Mark Noguchi of ‘Pili Hawai’i’ Catering & ‘Taste’ in Oahu and Nat Bletter of ‘Madre Chocolate’, a Hawai’i based chocolate company. Be sure to bring an appetite for ono island grown food! Directions to the Festival: Take Rte 130 to Pahoa. Turn left at traffic signal to Rte 132. Bear left at fork just after Lava Tree State Park. Turn right at four corners to Rte 137. Next to ’Ahalanui Hot Pond Park in the site of the old Village of Pu'ala'a. All of the Cooking Contest entry forms are available for downloading at the Kua O Ka La School website www.kuaokala.org and at Breadfruit.info in the Hawai’i HomeGrown Food Network site.